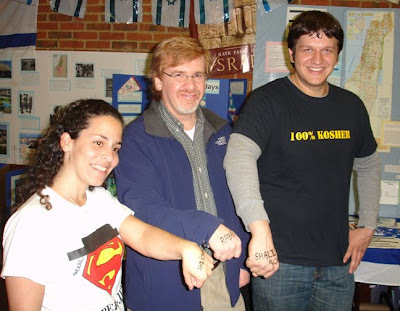 Michal Elboim, with Rabbi Brian Glusman of Birmingham's Temple Beth-El and Montgomery Shaliach Shimon Smith, at the University of Alabama at Birmingham's International Fair in January 2008. Pensacola’s Jewish community was stunned last night by the news that its Israeli Shlicha for the past year, Michal Elboim, was killed in an afternoon boating accident. According to authorities, Elboim was sitting on the bow of a 24-foot pontoon boat in Perdido Bay, near the Alabama-Florida border, when she fell and was struck by the boat’s propeller. There were 10 aboard, including four personnel from nearby Naval Air stations. Efforts to resuscitate her on a nearby dock were unsuccessful and she died at the scene. A helicopter had been called in but was not needed. Alcohol is not believed to have been a factor, and an investigation is underway. According to reports, the driver was teaching another passenger how to operate the boat, and Elboim fell overboard when the boat jerked suddenly. Elboim, 24, was born in Hod Hasharon and had been in Pensacola for the last year, teaching Jews and non-Jews about Israel. She also traveled the region with Shlichim from Montgomery, Mobile and New Orleans for a series of “Fab Four” panels, discussing growing up in Israel. She also staffed the “biggest and best” Israel booth at the University of Alabama at Birmingham’s International Fair. Ariella Feldman, program director of camping and Young Shlichim for the Jewish Agency for Israel, said the program would collect condolences and stories about Elboim for a book that will be presented to her family. The Pensacola Jewish Federation had been planning a farewell event for Elboim and to welcome her successor on Aug. 2. She had planned to return to Israel on Aug. 5.